I was given a lovely gift this weekend from a close friend. 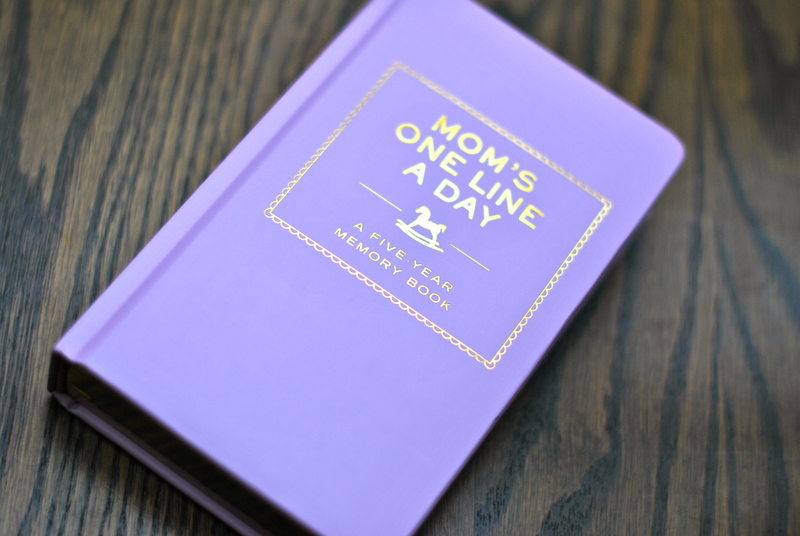 It was a journal titled, “Mom’s One Line A Day.” The purpose of this book is to log a quick thought about each day as it happens, realizing that we are all so busy that one line might just be attainable. It has room for 5 years of thoughts, all lined up for easy comparison between year one and year five. A snapshot of what was happening then, as compared to what is happening now. Or years from now, it would be an easy way to look back to see what we were up to during a certain phase of life. The question of how we hold our memories has been one that spins around in my head periodically with no real solution. There are moments when all I want is the ability to stop time. As I lay on the floor, watching my baby learn to roll over, I want to wallow in the moment, hold it close, and imprint it on my brain. As I see my four-year old son ride his bike without training wheels for the first time, I want to know that this proud, bursting feeling will be with me for the rest of my life. Having been through the baby stage before with two other children I know that I will be able to hold onto pieces of the moment, but not the whole thing. It will pass. People who have lived through parenting often tell others to “treasure every moment, it goes by so quickly.” I understand the validity of this statement, but I also find it absurd. Even when one feels blessed with health and happiness, there are still dirty dishes, sleep deprivation, and shirts covered in spit up to distract from beautiful moments. Hence my frenetic efforts at documentation… taking photographs on the last day of school, creating baby books, and writing down these random moments. As I do these things I wonder why I cannot trust my brain to keep these moments for me for a later date; why I must rely on these outside mediums as vaults for something so treasured? As my friend gave me this thoughtful gift, our babies were laying side by side – hers, six weeks old and precious for all his scrunchy newbornness, and mine, (almost) six months old and stretching out for her freedom. The miracle of growth and the passage of time were staring us in the face as we looked at what happens in just four months of life. We sat there in awe of what is occurring before our eyes and in our hearts. I am left knowing that I can (and will) keep documenting with the best of them, but the real key is to try to stay present for all of it. Now, I need to go wipe some spit up off the floor.